Few games have put a smile on my face as much as Yoshi’s Crafted World. From its gorgeously “crafted” graphics to its adorable, friendly characters, the game is a distillation of simple joy. Even though it doesn’t do very much that’s completely new or innovative, it excels at providing an excellently-presented game that’s bursting at the seams with gameplay that anyone can enjoy. In term of its narrative, Yoshi’s Crafted World keeps things appropriately simplistic. All the inhabitants of the island of the Yoshis are happily living with their magical Sundream Stone, a mystical object that can supposedly make wishes become reality. However, it’s not long before the dastardly Baby Bowser and Kamek show up and, deciding that they want the power of the Stone for themselves, end up shattering it. They scatter its gems all across the world, leaving it up to none other than our friend Yoshi to recover them and repair the stone before Baby Bowser can get his hands on them. It’s certainly a basic story, but it’s effectively told with character and charm, doing its job to get the main game started. Yoshi’s Crafted World is a largely traditional Yoshi adventure through-and-through. 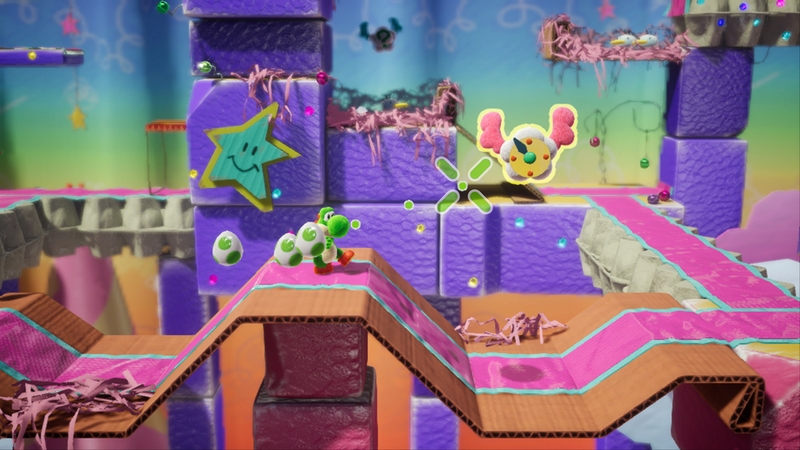 It features the same general gameplay flow that has become associated with the series, consisting of linear 2.5D levels mixed with light puzzle-solving elements, punctuated by Yoshi’s signature egg-tossing abilities. However, by no means does this well-worn structure ever feel dry or tired. 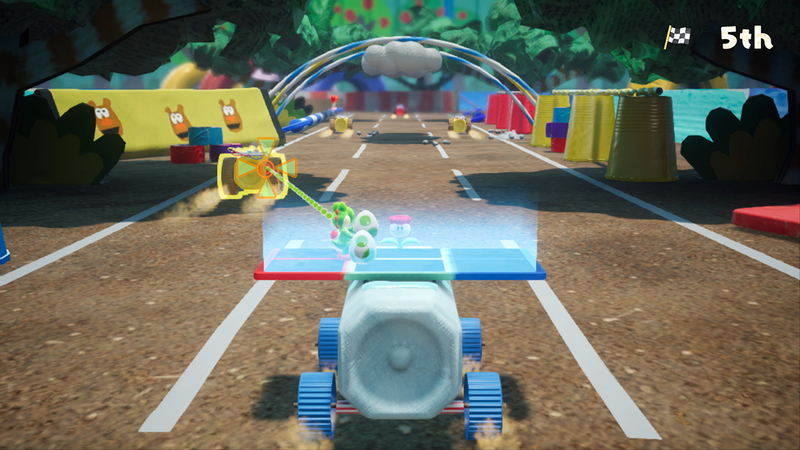 There are a handful of new mechanics, such as the ability to hurl eggs in full 3D, allowing free control of aiming at both the foreground and background. Even more importantly, the game does an admirable job of making each one of its many levels feel unique, providing a remarkable amount of variety in terms of both environments and stage gimmicks. For one thing, levels are no longer grouped into themed worlds. Instead, they are spread throughout the overworld in groups of two or three and unified by very general shared themes, allowing for remarkable stage diversity. Courses range from open fields to ocean depths, to pirate ships to dinosaur-filled jungles, and even ancient shoguns’ castles to the vastness of outer space. Furthermore, each one of these levels boasts of unique gameplay mechanics. These gimmicks aren’t anything especially inventive, but they’re all very well-executed and great fun to experience. In any given stage you may have to outrun a skeletal dinosaur, defeat as many moles as possible, drive a solar-powered racecar, or even engage in naval warfare, to name just a few of the many memorable gameplay situations. One of Crafted World’s most immediate characteristics is its distinctive art direction. True to its name, the game boasts a remarkable graphical style, presenting a world that looks like a particularly creative child’s arts and crafts project. The levels are constructed entirely out of household objects: trains are made of coffee cans, platforms are constructed out of pieces of cardboard, and UFOs are really upside-down pie tins. Exploring the levels and discovering their charmingly ingenious designs was pure delight. Additionally, all this is wonderfully rendered thanks to the powers of Unreal Engine 4. Between both handheld and docked modes, the vibrant visuals always looked crisp with flawless performance. Sometimes the graphics were so realistically rendered that I had to stop and wonder whether I was playing a video game or watching a high-quality stop motion film. This crafted theme leads into one of the game’s bigger new mechanics: the ability to explore each stage backwards through its “flipside.” These flipsides all focus on rushing through the level to gather three Poochy Pups who have hidden throughout the stage. Unfortunately, playing through the courses in reverse tends to remove the gimmicks that made the stages so enjoyable in the first place. But the flipsides never became too offensive to me, since it was usually interesting to see the level from a completely different perspective. The novelty of seeing the tape holding up each piece of cardboard and the empty cereal boxes that made up the stages’ walls never wore off. Despite its impressive art and gameplay variety, repetition still manages to be a serious issue for the game. This problem appears first in the soundtrack. While the lighthearted music is well-composed with some fun instrumentation, the vast majority of stages use the same melody, which can get monotonous fast. Additionally, if you’re trying to complete everything the game has to offer and collect all you can, you’re in for a long and tedious ride. Essentially everything is now a collectible – even your health meter. This means that if you want to gather all the main collectibles, you’ll have to overturn every bush in the background and foreground, scouring each level for every single common coin, flower, and heart. Likewise, each area in the game includes missions that effectively function as fetch quests, asking you to gather specific items in each stage – which, again, can get monotonous. Thankfully, most of this is completely optional, especially considering that there don’t seem to be too many truly enticing rewards for 100% completion. When not attempting to drudge through Crafted World’s subpar side content, its atmosphere truly shines through. Everything in the game drips with happiness – even the enemies that roam the levels seem like they’re all having a great time. The game does continue the series’ tradition of being quite easy, but I found that that only contributed to the pleasant, laid-back atmosphere, making for a distinctly relaxing experience. All told, between the astounding graphics, remarkable level variety, and overall charming atmosphere, my time spent with Yoshi’s Crafted World was filled with childlike joy and wonder. It isn’t any sort of watershed moment for platformers, but if you’re not looking for the next genre-defining experience, you’ll easily appreciate Crafted World for what it is: a finely made and beautifully presented game full of pure and simple fun. 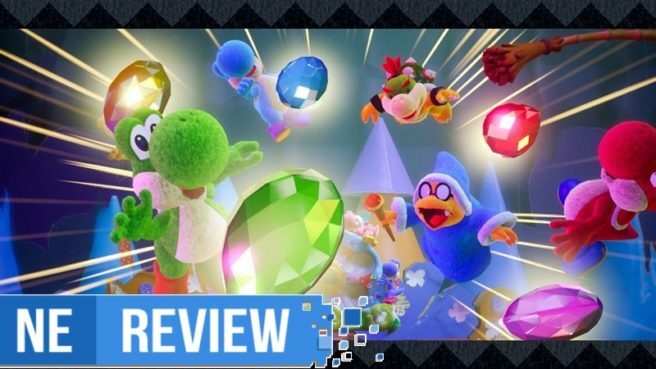 Yoshi’s Crafted World review copy provided by Nintendo for the purposes of this review.